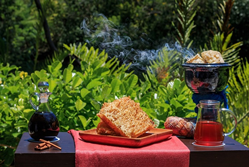 Sweet new experiences incorporating honey produced at the hotel are now available at the Grand Velas Riviera Maya. Freshly harvested daily, the honey is produced by the western honey bee found only in the Yucatan Peninsula. Available at the resort’s restaurants and 24-hr insuite dining, the honey is a perfect complement to fresh tropical fruit, buñuelos (fried dough) and capirotada (Mexican bread pudding). Those with a sweet tooth can add the honey to Mexican candies such as palanquetas (a Mexican nut or seed-based bar) and amaranth for an even sweeter treat. Soon, the hotel will roll out new flavors of its special honey such as orange blossom and mango. The honey is produced by the western honey bee found only in the Yucatan Peninsula. Additionally, the honey is used in a treatment at the award-winning SE Spa. Inspired by ancient Mayan practices in the Yucatan Peninsula, the 80-min Organic Kaab Honey Experience starts with a relaxing face and body massage featuring the honey. Next, guests indulge in a bath with elixir made from the medicinal Chaka tree which heals the body’s energy. Following the bath, guests are given a balm made with Mayan vanilla to seal the skin.